With many schools already in session and others following right behind, are you ready to ramp up your lunchbox game? You’re in luck! Take a look at some of our favorite lunchbox ideas that will have everyone at your child’s lunch table clamoring to trade. Make a pizza quesadilla by adding store-bought tomato sauce and your family’s favorite pizza toppings to the inside of a regular quesadilla. When your children bite into it, they will feel like they’re getting a special treat and you know they’re getting the health benefits of dairy that will help them power through the rest of their day. Give your pinwheel sandwiches school-spirit pep with tasty additions. Create a base of tortilla with cheese or deli meat, then play around with toppings matching your school colors. Are your school colors green and blue? Add kiwi on top of a layer of cream cheese swirled with blueberry jam. Does your school bleed red and black? Roll up a tortilla with pepper jack cheese, red bell peppers and black olives. The possibilities (and colors) are endless! For this special dessert, core an apple and cut horizontally so that the slices resemble ring shapes. Pack the apple rings along with a yogurt tube and fun toppings, such as mini chocolate chips, sprinkles or granola. 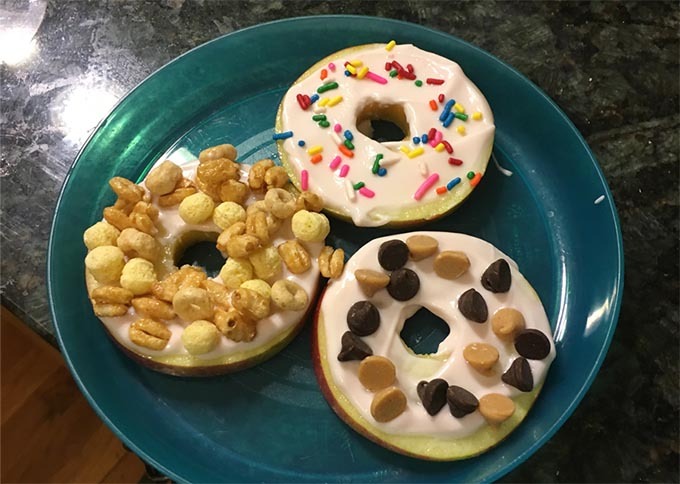 Your kids will have fun topping the apple rings with yogurt “icing” and toppings while enjoying a delicious and healthy dessert! With these delicious dishes in tow, everyone in your child’s class will be begging them to trade and you can feel great that you’ve fueled them with great nutrition for the rest of the day. For more recipe ideas, check out our Kid-Friendly Recipes.